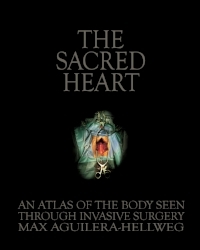 Max reads from his book, The Sacred Heart, broadcast on NPR, All Things Considered, September 14, 1998. He writes, " The night before I was to see my first operation, a friend asked me if I was worried I would get sick. Far from getting sick, I felt what I can best describe as awe. Entering the operating room was so foreign to any previous experience that I couldn’t place it. I couldn’t compare it to anything. It is one thing to know there is a spinal cord in the hollow of your back; to see one real is altogether different." I'M a product of the border. My mother lived in Juárez, my father in El Paso. When she was a teenager, she crossed the river and worked for my dad. They moved to California. I was born in Fresno. Farm worker country. But we lived in the suburbs. When we returned to El Paso to visit relatives, we'd cross the bridge into Juárez so my parents could drink, and me and my sister could buy bulls' horns, sombreros and velvet Jesus paintings. The streets were packed. I held onto my mom's hand for fear I'd lose her grip. But I did. I spun around, there she was. Mexico staring me in the face—a stump on a skateboard, amputated, her hand held out begging for pesos. Out of the womb I was dubbed "The Chinese General." It was Fresno, '55. I guess it was my slanted black eyes, toothless gape and the purple splotch covering half my head. My father had a way with words. You see, right from the start I didn't know I was Mexican. Although my mother—the darkest of my grandmother's litter—was, I didn't think about such things, my father was white and Texan. Anyway, I was just a kid. Sure, my skin was brown, but we didn't speak Spanish. My father didn't like it. I figured I was white. Fresno was farmworker country. Cesar Chavez, Delano, right next door. We lived in the suburbs. When I was two we moved to Glendale. Blacks couldn't own property in Glendale, couldn't be on the street after five.